Senate Majority Mitch McConnell on Tuesday advanced a longtime Republican policy goal on how to tackle the debt during an interview Tuesday, but the idea probably won’t gain a foothold anytime soon. During an interview with Bloomberg on Tuesday, McConnell said that to get the federal budget deficit under control – the deficit grew to $US779 billion in fiscal year 2018, the largest since 2012 – Congress needs to reform entitlements such as Medicare, Medicaid, and Social Security. Despite an appetite for reforms and full control of the federal government, Republicans have made no headway on entitlement reform during Trump’s presidency. But the GOP leader also laid out exactly why his solution to the deficit and debt would not happen anytime soon: There’s no way Democrats are getting on board. McConnell emphasised that any significant changes to Medicaid, Medicare, and Social Security would need to get sign off from both parties. “It’s a bipartisan problem: unwillingness to address the real drivers of the debt by doing anything to adjust those programs to the demographics of America in the future,” McConnell said. 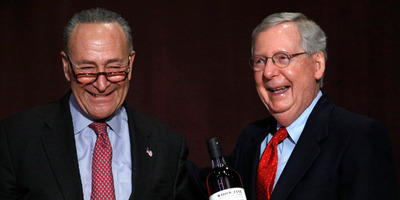 Democrats have been reluctant to help advance any major goals of the GOP-led federal government, and Democratic leaders immediately blasted McConnell’s idea. Additionally, Democratic policies are also heading in the opposition direction of McConnell’s goals. Instead of pairing tax cuts with entitlements cuts, Democrats are suggesting these programs become even more generous and paired with tax increases. As McConnell mentioned in the Bloomberg interview, a growing number of Democrats are supporting Sen. Bernie Sanders’ “Medicare for All” plan, which would expand the government healthcare program to all Americans with funding from a tax bump. On top of the opposition from Democrats, it’s unclear if Republicans could get their entire party on board with the idea – especially their leader. President Donald Trump has repeatedly promised to not cut Social Security and Medicaid before, and reiterated a similar position during an interview with The Associated Press on Tuesday. Last year, a Republican member of Congress told Business Insider’s Joe Perticone that Trump told him he wouldn’t consider changes to entitlement programs until a theoretical second term.